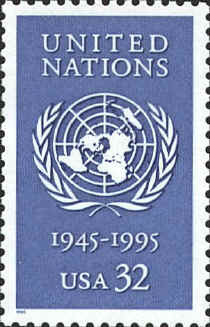 The stamp marks the 50th anniversary of the founding of the United Nations. The symbol of the United Nations is a world map on a polar projection with a wreath of olive branches. 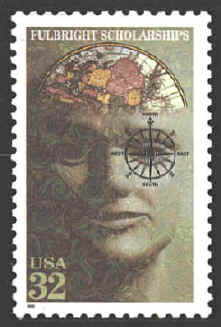 The Fulbright Program is designed to "increase mutual understanding between the people of the United States and the people of other countries...."
The design for the Fulbright Scholarship commemorative combines a compass card and the map, Nova Orbis Terrequei Tabula Accuratissima Delineate Mappe Monde, published in Leyden in 1713 by Pieter Van der Aa. Pieter Van der Aa was born in Leiden in 1659. He was apprenticed to the booksellers trade at the age of 19 and died in 1733. Many of his atlases were made to order from outdated plates acquired from many of the older well-known cartographers. He served with the Dutch colonial authorities on the island of Java, and published an atlas of European voyages of discovery in the Pacific, of which this map is a part. The projection is an equatorial stereographic projection. This is indicated by the parallels, particularly the 80th, which intersect the meridians at right angles, unlike the globular projection where the parallels are not at right angles. 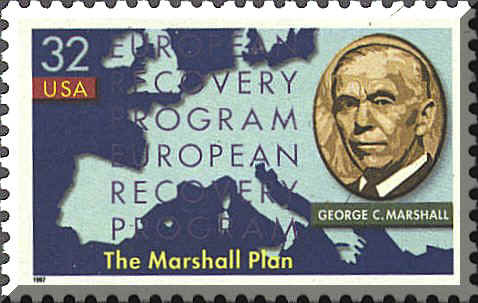 The stamp commemorates the European Recovery Program, better known as the Marshall Plan.